The Evolution consists of 2 groups of axes, the grinding unit and the workhead unit. They are mounted onto an extremely firm cast iron base plate. The base plate is supported by special anti-vibration pads, to avoid interferences from external sources. 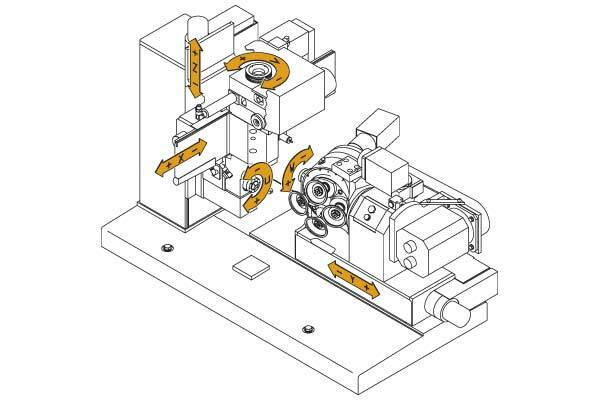 The grinding unit (Y-axis) controls movement of the grinding wheels. The workhead unit (U, V, X and Z- axes) controls movement of the tool. The U-axis has dual functionality: it can be used as a positioning axis or a free-turning spindle (used when cylindrical grinding). The TTB kinematic allows the wheels to grind above or below the tool. The thermal stability of the machine components are guaranteed by the use of temperature controlled fluids. All required grinding wheels are always and instantly ready for use in the machine. The selection of the grinding wheel is performed in 6.9 seconds. Absolute accuracy in positioning and repeatability. The tools can be ground in one clamping and with the highest degree of precision. Additionally, the linear axes have a “one of a kind” motion-driving system; a combination of hydrodynamic technology and a calibrated preload. The conclusion: guaranteed, unparalleled repeating accuracy and backlash-free movements.